Become a sponsor today and help us continue helping others in our community. Click the image BELOW to download our sponsor information. Thank you!! Since 2006, The Bonita Blues Charitable Foundation has been dedicated to producing one of Florida's finest blues festivals and has donated over $254,000.00 of our net proceeds to local charities in the Southwest Florida area. 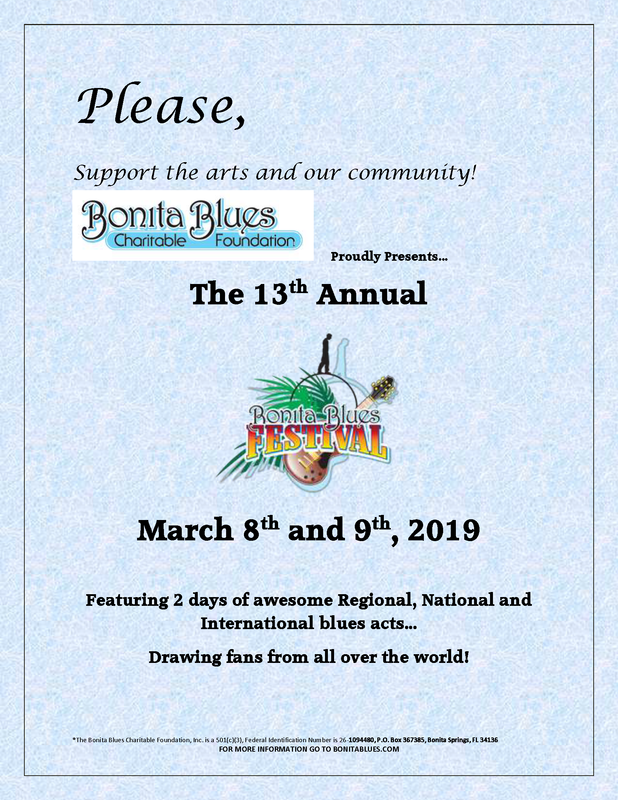 The 12th annual festival will be held in Bonita Springs most admired live musical and event venue; Riverside Park on March 8th & 9th, 2019. The 2 day event will feature over 10 local, regional, and international blues bonds. Year after year the awareness continues to grow along with the number of attendees that come not only from the Bonita Springs area, but from the entire country and some from outside the U.S.A. The 100% volunteer driven foundation and Festival committee are solely dedicated to producing the finest annual blues festival in all of Southwest Florida, while donating 100% of the net proceeds to charities. Our 2019 charity benefactors will be; Music for Minors Foundation, The Music Therapy Program at the Golisano Children's Hospital of Southwest Florida, and The Bonita Springs Assistance Office. All of these charities ore entirely funded through philanthropic contributions such as The Bonito Blues Charitable Foundation. The Music For Minors Foundation works closely with string orchestra and band teachers to identify qualified students who sincerely desire to make music a port of their lives but lack the financial backing to purchase an instrument. The Music Therapy Program helps thousands of children and adolescents each year manage pain, express emotions, improve coping skills, and experience less stress and decrease pain and anxiety during medical procedures. For over 25 years, the Bonito Springs Assistance Office has served as the primary social service agency in Bonita Springs, helping residents at a time of crisis. They offer services such as a food pantry, clothing, school supplies, medications, dental needs, and life skills counseling. To date, we have donated over $254,000.00.